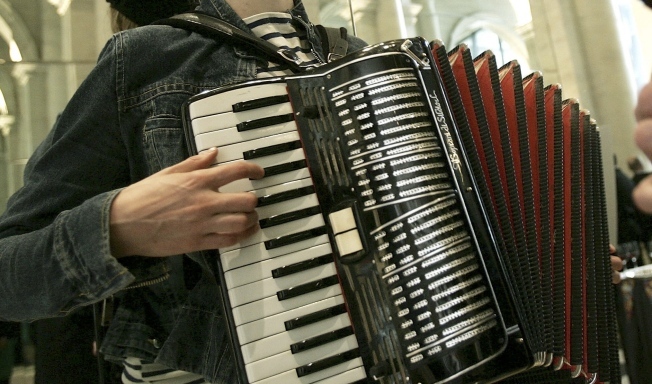 Musette Explosion revisits squeezebox sounds of WWI France at Barbès. FRESH SQUEEZED: Have you seen Chocolat more than once? Do you wish you were in 1940s France, swirling under the trees in a floral dress? Then hit Barbès tonight, when Will Holshouser, Matt Munisteri and Marcus Rojas bring their Musette Explosion -- a tribute to French accordion of the '30s and '40s -- into the 21st century. 10PM. BUZZED: Go and catch Lissy Trullie at (le) Poisson Rouge as she surfs a massive wave of hype all the way into your consciousness. If you can get her song "Self-Taught Learner" out of your head after the show, we'll be impressed. 11PM. SIGN O THE TIMES: A bunch of NYC media bigwigs -- from Village Voice publisher Michael Cohen to Jake Dobkin, publisher of Gothamist -- will tackle that pressing question: are blogs really going to make print obsolete? Print vs. Blog: The Many Faces of Cultural Journalism at 92Y Tribeca, 7PM.